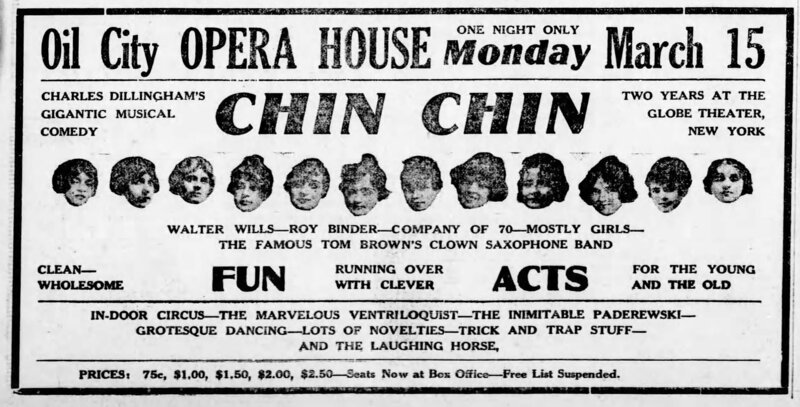 We know that “Chin-Chin” played at the Franklin Opera House in Franklin, PA, on March 12th. Certainly, the troupe played somewhere Saturday and Sunday, the 13th and 14th, but I have not discovered where—Yet. On the 12th ran a common “girls ad” for the show (See above.) and on the 13th a different advertisement ran. There was no Sunday paper for the News-Herald. The show may have sold out before Monday the 15th because there were no ads in the Monday paper. I have not found any reviews or post-show information on this presentation. The Julius Cahn guild mentions that there were two newspapers, in Oil City, first the Blizzard with a circulation of 3,000 and the “Derrick” with a circulation of 6,075. I have not found either of them available online. The newspaper articles and advertising I have found are from the “News-Herald” in Franklin, PA, which is about 8 miles away. The Oil City Opera House was first built in 1872 at the head of Center street. It burned in February 1884. In the summer of 1885, several businessmen purchased the site and began construction of a new opera house. The site again burned during the 1890s. [iii] I’m not sure what would be considered “the head of Center Street.” But based on my guess, today it currently appears to be the site of an old (1940s? ), abandoned bank building and a parking lot. [i] The News-Herald (Franklin, Pennsylvania) · Wed, Mar 10, 1920, · Page 10, via Newspapers.com. [ii] The Julius Cahn Gus Hill Theatrical Guide for 1913-1914, Page 589. Finishing their one-night show On April 22nd at the Frederick City Opera House, the cast and crew of “Chin Chin” packed up and rolled the 65 miles north to Carlisle, PA for the show the next night at the Carlisle Opera House. The show appears to have gone on without a hitch, and the show packed up and headed east to Reading for a show the next night. [ii] Carlisle Evening Herald (Carlisle, Pennsylvania) · Mon, Apr 19, 1920, · Page 7 – “CHIN CHIN”. Newspapers.com https://www.newspapers.com/image/269958879. [iii] The Julius Cahn – Gus Hill Theatrical Guide – 1910, Page 679, Carlisle. [iv] “The Dickinsonian – Dickinson College, Carlisle, PA, March 1888, Page 10, THE COLLEGE GLEE CLUB CONCERT – http://deila.dickinson.edu/cdm/ref/collection/dickinsonia/id/28932. [v] Condee, William Faricy – Coal and Culture: Opera Houses in Appalachia – Ohio University Press, Athens, Ohio 45701 (c) 2005 – Pages 54 & 55. [vi] “The Dickinsonian” – Dickinson College, Carlisle, PA, Friday, May 1, 1959, Page 3, ‘BUCKET’ OPENS FOR DICKINSON PRESENTATION. http://deila.dickinson.edu/cdm/ref/collection/dickinsonia/id/18415. It had been a busy week. We now know “Chin Chin” played at the Park Theatre in Youngstown on Thursday[i] and the Victoria Theatre in Steubenville on Friday. It was back to the train and headed west about an hour to New Philadelphia for a one-night show at the Union Opera House on Saturday, April 10th. 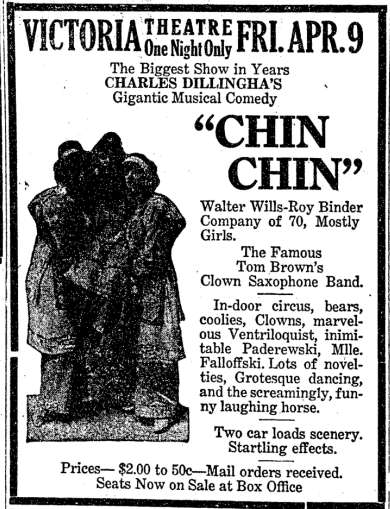 The initial notice for the show appeared in The Daily Times (New Philadelphia) on April 3, 1920, which was the Saturday before the Saturday show. The Daily Times was the major newspaper of the area with a circulation of 2,575 per the Julius Cahn Theatrical Guide of 1914. Advertising during the subsequent days let folks know many of the particulars of the show, including two car loads of scenery, seven sets, indoor circus, and, of course, the Clown Saxophone Band would be there. Besides the stars, Walter Wills and Roy Binder, Ethel Lawrence and George Usher are mentioned in articles. On April 8th, the Daily Times did run a photo showing 16 of “Chin Chinners.” I don’t see Donna in this group, but with 65 women in the show that is understandable. The show itself appears to have gone off without a hitch. According to the “Daily Times” of April 12th, the show had the “biggest crowd of the season.” However, across the street, three men robbed the Union Restaurant at gunpoint during the show. I’ll bet that disrupted theatregoers from having a bite after the show. Three gunmen — $19.00 taken. They apparently didn’t know what they were doing as they left $40 in silver in the cash register and just took the folding money. I have not been successful determining the exact location of the Union Opera House. Some articles indicate that it was “near the courthouse.” A review of the 1921 City Directory for New Philadelphia indicates that it was “at rear of Hotel Reeves Building.” That same directory indicates that the Hotel Reeves was at 133-135 North Broadway[ii], which seems to be where the county courthouse is. 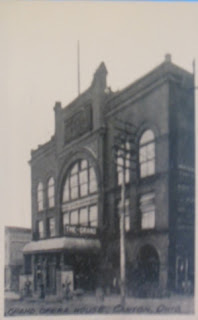 The Union Opera House had a capacity of 1,057 – 502 on the main floor, 230 in the balcony, 300 in the gallery, and 24 in box seats. The US Census indicates that the population of New Philadelphia, OH was 10,718,[iii] so the venue could hold nearly 10% of the population of the city. However, the city of Dover is adjacent to New Philadelphia and contributed another 8,000 to the population. The Union Opera House was probably built in 1863[iv]. The Union Opera House was destroyed by fire in November 1893. Rebuild date is not known. I have contacted the Tuscarawas Historical Society regarding information about the Union Opera House (Theatre) regarding the history and the disposition of the theatre. [ii] Ancestry.Com – U.S. City Directories, 1822-1995 – New Philadelphia, Ohio, City Directory, 1921, pages 136 and 219. [vi] The Julius Cahn – Gus Hill Theatrical Guide (1913-1914) – Page 525 – New Philadelphia. We know that Chin Chin played on April 5 at the Sandusky Theatre in Sandusky, OH on April 5th and played at the Faurot Opera House in Lima, OH on April 6th. We don’t know if the show was on holiday Wednesday and Thursday, or not, but they resumed playing Friday, April 9th at the Victoria Theatre. It was not the custom for women to appear publicly in the theatres of Europe either on stage or in the auditorium until many years after the death of William Shakespeare. The women who did venture to the theatre always were masked. Most of Shakespeare’s heroines were acted in his days by boys. There are no records of women acting on the English stage until after the Restoration, when the floodgates of licenses were let down ________________ of owmen choristers in opera is of comparative recent ________ tribute in such entertainments as those which managers like Mr. Charles Dillingham presents __ which “Chin Chin” to be offered at the Victoria Theatre Friday night, April 9 is a notable example. I agree that having fifty plus attractive women added to the success of “Chin Chin” at the box office and have seen advertising articles highlighting that fact before, but I had never seen anyone tie it to Shakespeare and Greek plays before. Again, on April 7th, the Steubenville Herald-Star newspaper had another article on page three. I can’t tell if it is fact or show business fiction nor if it gives insight into the life of Walter Wills or only insight into the culture of the time, but it is an interesting story. “Chin Chin” at the Victoria Theatre…. Walter Wills and Roy Binder in this fantasy have become a couple of Chinamen who have more or less thrilling adventures in the pursit of the Lam which brought to its possessor all manner of happiness. Both of the comedians have studied closely in the mannerisms and idiosyncrasies of Chines personality, and one of them had least has a more than casual acquaintance with the Chinese Language. For those of you who follow my Blog, I normally have a short history of the theater. I have about a half a dozen sources I typically go to find information including Julius Cahn Theatrical Reports and several “go to” websites such as Cinema Treasures. But, in the case of the Victoria Theatre in Steubenville I found virtually nothing. I even messaged the Jefferson County Historical Society asking about the theatre but received no response from them. I know the theater existed in 1919, 1920, and 1921, but I know nothing more. Not when it was built, not its size, not is current status. If I learn more, I will post it. If you know more about the Victoria Theatre in Steubenville, please add it to the comments below. Thank you. 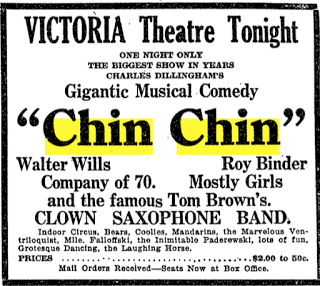 Keep researching to determine if “Chin Chin” played on April 7th or 8th 1920. Learn more about the Victoria Theatre of Steubenville, Ohio. [i] Note: This newspaper has an unusually high number of errors. For the sake of readability, I have corrected most of the spelling and typesetter errors rather than creating a verbatim transcript. [iii] Steubenville Herald-Star April 5, 1920, Page 3 via Find-my-Past.